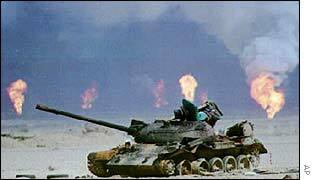 Saddam torched Kuwaiti oil wells - would he burn Iraq's? With the world's second largest oil reserves, Iraq has vast potential to help feed the global thirst for oil. But after two decades of war and sanctions, the industry desperately needs funds only foreign investors can offer. War sceptics have questioned whether oil is a motivating factor for the world's most powerful nations - especially the United States - as they thrash out the case for military action. In its oil-producing heyday in the late 1970s, Iraq was producing 3.5 million barrels a day. Industry analysts estimate that with large-scale investment in the country's rusting industrial infrastructure, this could be upped to six million. This would make Iraq the fourth largest producer, behind Saudi Arabia (8.8 million), the US (7.2 million) and Russia (7.1 million). Iraq has struggled with foreign-owned companies for control of its oilfields since oil was first found in the country in the 1920s. When the industry was nationalised in the 1970s, oil revenues increased five-fold, boosting Saddam Hussein's ascent to power and providing funds for development and the country's growing military arsenal. But 15 years later, at the height of post-1991 Gulf War sanctions, the industry was on its knees. Oil production dropped nearly 90% in the six months after Saddam Hussein invaded Kuwait. Under the initial embargo, all exports, imports and foreign investment were banned. In 1996, with the country on the verge of a humanitarian catastrophe, the United Nations allowed Iraq to begin exporting a limited amount of oil - $2bn every six months - to buy humanitarian supplies under the "oil-for-food" programme. By 1998, oil prices had dropped. The UN permitted Iraq to import some spare parts for dilapidated production facilities and increased the threshold to $5.2bn. For the following two years the country failed even to achieve this quota. UN Secretary General Kofi Annan wrote that the industry continued to be in "a lamentable state". UN experts visited Iraq and concluded that some of the damage done to the oilfields during the previous two decades was irreparable. If production was suddenly increased without upgrading the old equipment, they said, more damage would be done. Since 2000, the threshold has been lifted completely. The value of spare parts bought under the oil-for-food regime has reached $4.8bn. Production has risen to about three-quarters of its pre Gulf-War level. Recent years have seen a flurry of negotiations between Baghdad and overseas investors hopeful that sanctions would soon be lifted. Iraq struck agreements on oil exploitation with Russia, France, Vietnam, Syria and a number of other countries. But as war has become increasingly likely, fears have grown among potential investors that a new US-supported Iraqi government would tear up such agreements and negotiate its own - primarily with US-based companies. Iraq has recently reinstated a $3.7bn contract with Russia's largest oil company, Lukoil, which it cancelled in December. The move may have been a political response to Russia's backing of UN resolutions on weapons inspections. There are also concerns that war could bring a re-run of the devastation wreaked on Kuwait's oil industry during the 1991 Gulf War. Saddam Hussein's forces set alight at least 600 oil wells and opened the taps on many others, spewing the equivalent of some eight million barrels of oil into the Gulf. America's military plan is reported to include securing the oilfields, although according to the administration this is to protect and hold them "for the people of Iraq". "There is real concern as to how to protect the oil fields across the region"